7.93 points at 14 votes (rank 95). 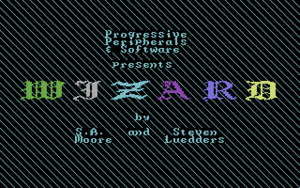 Wizard is a classic platformer and was developed at the same time as Jumpman. Wizard resembles Jumpan, e.g. in the possibility to set the game speed by pressing a key during the loading of a level or the elements in the levels. What Wizard silhouettes against Jumpman are on the one hand the further elements as the treasures, the key and the keyhole, the diversity of the enemies and on the other hand the ability of the pawn to actively defend itself - that is with magic spells. The aim of each level is to collect the key and after that to leave the level over the keyhole. The longer one is in the level, the less bonus will you get at the end of this level. In the level only the treasures get you points. 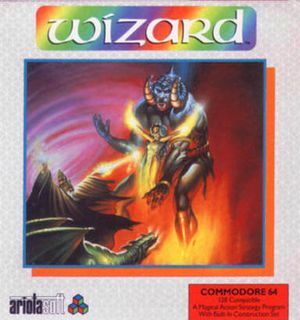 Wizard needs to fight through altogether 40 levels, each 10 levels per difficulty grade. The game also contains a level editor, with which you can change or create levels and save them on disk. There is no music in this game, but almost everything creates a sound effect. So e.g. there is a sound during the building up of the stones, the ladders, ropes, keys and keyhole. During playing alomost everything that Wizard touches makes a funny sound: when collecting treasures, climbing ropes, using letters, collecting keys and disappearing through the keyhole. The levels are multi-coloured, as the colours of the different elements differ from level to level. The colours can be chosen when creating a level in the editor. Apart from the Wizard himself, there are many elements that are animated. The enemies and also elevators move in the frame that has been assigned to them, fire flickers to and fro, the treasures flash in all colours. If Wizard runs into a peril, he will crash in a nice animation with a sound effect that may raise a smile in some people's faces. And if you look very close while casting a spell, you can see that Wizard makes a small movement with both hands. After that you choose by joystick up/down the number of players and after pressing the fire button the first level is already loaded. The game speed is chosen by pressing one of the number keys during loading. – Wizard moves left and right on the floor, if he encounters ladders or ropes he will go up or down. – Wizard jumps in the desired direction. Here you need to mind that the landing must not be too far from the ground, as otherwise the wizard will crash. 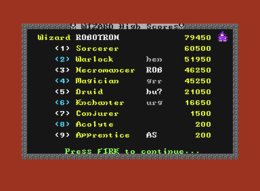 In the lower part of the screen for each level the player, the level number, the points, the number of lives, the speed, the bonus bar and the magic spell is displayed. Here the number shows how often the spell can be cast and below that its type in capital letters. The arrow moves with Wizard and shows in what direction the spell will be cast. Every 10.000 points you will get a life, after every stage - depending on how you have done - several lives. Stone floor – most of the time it is there permanently, but can also flash or get invisible, recolour, disappear or reappear when picking up a treasure. Stairs – you can use it to overcome heights, but it can also happen that it keeps changing to a slope. Arrows – they teleport the Wizard into the direction that they point into. Most of the time they are surrounded by an arc. During teleporting Wizard pervades walls and is invulnerable. In this state he can be steered. Fire – it flickers and must absolutely be avoided. Wizard can jump over it but he cannot destroy it with one of his magic spells. Elevator – It can go horizontally, vertically or diagonally. To ride, just jump on it and to go off just jump from it onto solid ground. Some monsters and especially the slime use the floor and move more ore less oriented at the position of the Wizard. They can use ladders but not ropes. If you take the floor under your feet they will dissolve. Other monsters fly in the air and also move in orientation to the position and movement of the wizard. They can move behind all elements. Enemies as arrows, stones and small ice balls after the example from Jumpman fly vertically and horizontally in straight lines. Here they are strongly geared to the position of the wizard. If the wizard walks close to the border of the screen no danger will com from this side - but instead from the other side. Invisibility – The wizard gets invisible (black) and is also for the player hard to see. Touching the enemies and falling from platforms (possible with Invisibility) weakens the spell, touching skulls are still deadly. Feather Fall – The wizard moves downwards until the next platform and is invulnerable during this movement. This spell can still be used when you have already crashed. Haste – The complete level is accelerated. Slow - The wizard and the enemies move slower. 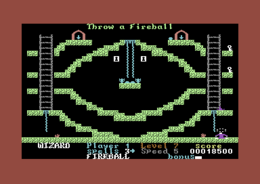 Fireball, Enchantment, Magic Missile, Disintegrate - a simple shot; the joystick decides the direction in which the shot will go. Freeze – a shot that stops the enemy for a short time when being touched by it – the enemies can be touched during this time without peril. Teleport – The wizard teleports himself back to the starting position or respectively the last teleport position. During this time he is invulnerable and can also use this spell to suspend a crash. Levitation – The wizard hovers upwards to the next platform. During this time he is invulnerable and he can use this spell to suspend a crash. The editor is controlled over the keyboard and takes getting used to. The F-keys are mainly used. The colour of a level is determined by the extended character set of the C64. You can also slide down on the stilts of ladders: just stand on the appropriate place and jump once, which e.g. is needed in the level Fire Alarm. When you have played through all levels the game goes into the "Mystery“ mode. Maybe there are more levels on the disk, which can be played in the Customized mode. Not all monsters are enemies, e.g. the purple cat in Wizard's Pet can be touched. In the level Simon says you need to - according to the known game - collect the type of treasure that Simon announces. If a treasure type is displayed that Simon has not announced, you'd better avoid it. When you teleport yourself you cannot land on a piece of floor where a rope starts or which is craggy. You can land out of a jump on ropes and ladders and jump from any place on them onto another place. The level name most of the time gives away what expects you. The level "Bats in the Belfry" belongs to the levels, where you need to collect a certain treasure to finish it. One of the treasures opens a wall which hinders you to land directly in the keyhole. So you first teleport yourself up to the key and on the way collect the treasure. Then you cast yourself back to the starting point and teleport yourself over the arrow onto the platform below the keyhole to then jump into it. Until now there are no cheats known for this game. 1570: "Wizard is in almost every respect more than Jumpman. More levels, more extras, more going on in the levels. I think it is a bit a pity that there are rather many levels that are built up according to scheme F (key, keyhole, gold, a few enemies, fireball as spell, there you go). 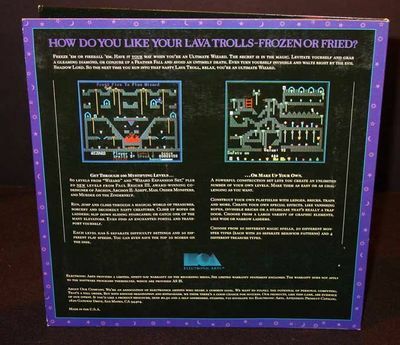 The fun of the game in Wizard comes more through the level build-up than through the specials as in Jumpman (Hot Foot, Runaway...)." Robotron2084: "In contrary to the boring Jumpman Wizard bristles with variants and small gimmicks. First one should name the existance of the spells and the tactical component that goes with this into the game. And there are loads of differently acting enemies. In any event more levels. And although Wizard only forms a "copy" of Jumpman, it beats the model on the whole line. Forcefully! Diversification, hectic and bizarre sounds are on the agenda. Wizard is, to say it short, in my opinion together with Auf Wiedersehen Monty and Impossible Mission the fantastically best platform jumper on the cevi ever. A great game, that gets full 8.5 out of 10 points from me!" Camailleon: "I loved to play this game as a kid, it has mulitple colours and diversified levels and you never get the impression that the next level is not feasible. Today I also know how to use the spells and it is also today great fun!" 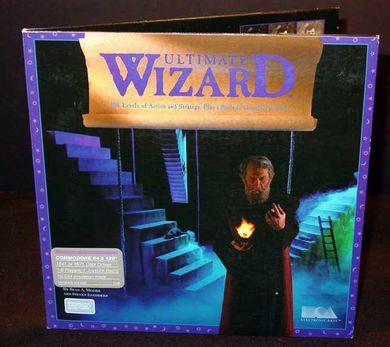 Front side of the "ultimate" version of the game by Electronic Arts.